I am not ready to let summer go. The last day of summer was this week; however, it seems like summer has been gone for a whole month. Since August, the nights have already started getting cooler. Once September rolls around, the nights seems a little nippy to me. Reaching for my coat, brought sadden to my heart since I knew that frost was right around the corner and the end of my garden was in sight. Despite the cooler weather, my garden gains a second wind. My plants that were beaten down by the extreme heat of July and August seem to perky up and start flowering again. My green beans looked like goners with its shriveled up leaves and few remaining green ones. Just the other day, I noticed new green leaves forming and I am hoping for some more green beans for a fall harvest. My nasturtium has come alive again flushed with beautiful orange color. Just in time for Halloween, don’t you think? My sweet potato patch is growing like a weed. It is the first time I have grown sweet potatoes. I keep feeling around the raised mound is there are any buns in the oven. Don’t feel any yet, but the ‘taters might be deeper than the mound. By the way this is a northern variety which has a shorter growing period. This bee was not being very cooperative as I was trying to shoot its picture. My fury friend was sucking the nectar form my Aster. This plant has a story in itself since I acquired it from a local garden club. Apparently, it was given to the club, having originated from someone’s garden, to sell as part of their fundraiser. I have never seen an Aster like this before. It stands about 3 feet tall and has grown like a weed with multiple stems. My other Asters have rounded pear like leaves and are much smaller. Has anyone seen this type of Aster? Is it an heirloom Aster, if there is such a concept? This is my corn that did not seem to grow as fast as it did last year when it was grown in a raised bed. I tried to grow it around the perimeter of the garden. Out of 18 seeds, only 8 corn stalks have grown. Notice the red silks. I have one ear that is growing nicely and I can’t wait to see what the ear looks like. This corn is an heirloom variety. My roses are looking beautiful since the Japanese Beetles have disappeared. They ravished my roses and strawberries. Now, all the grubs are in my beds since the animals are tearing them up looking for the grubs at night. I guess this is Mother Nature’s circle of life. Swiss Chard is the most beautiful and indestructible plant I know. It does not care if it is hot or cold. It just grows. I previously wrote an article in the summer that I thought one of the plants was on steroids since it went to seed early in the season. This seemed really unusual. I recently cut it and used it to make a black-eyed pea and Swiss Chard dish and a bulgur and greens dish from the Moosewood low-fat recipe book. (See the bulgur dish below.) In just a couple days, the Swiss Chard just took off again. I think it enjoys being trimmed. I let this carrot grow for the longest time, so this explains why it is pretty wide. I did not realize that most of my guests did not like beets. Although you really could not taste the beets, one of my guests would not touch it, since the dish reminded her of having to eat beets as a child. Bad memories. What part of summer do you miss the most when Fall comes around? Any gardening wonders or mysteries growing in your patch? Updated 12/11/2011: I grew Sweet potatoes again and boy were they bigger than life. Check out my sweet potato article. Oh, and there is the long fanged parsnips too. Why do vegetable grow so weird in my garden? Gosh, you have been busy. I’ve had an absolute glut of tomatoes this year despite our poor summer. 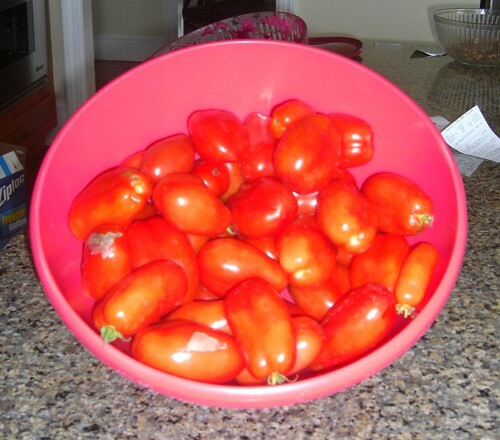 As I’ve been picking them I’ve been keeping a ‘tomato tally’, and so far it totals twenty pounds! There’s still more to be harvested – probably more than I know what to do with. I’ve started having a go at preserving them. My garden didn’t go so well over the summer, but since I’m in southern California we’re going to do a bit of planting for the fall. Pretty long growing season around here, after all.